Today we drive from Lhasa to Gyantse via Kampa La pass (4794 m) and Yamdrok Tso (4482 m) also known as Turquoise Lake (600 square km. ), one of the three largest lakes in Tibet. Enroute we cross Karo La pass (5010 m) and two other smaller passes before reaching Gyantse Town. 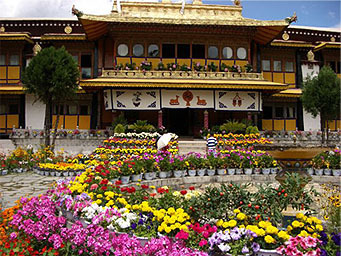 Gyangtse was earlier the Tibet's third most important city, lying in the Nyangchu valley and along the main routes from India and Nepal to Lhasa. In former times it was a fort as well as the centre of Tibet's wool trade and a gateway to the outside world. We have an overnight stay at the hotel in Gyantse. driver. For groups an individual air-conditioned bus will be provided.